A few thoughts about the Fuji 60mm macro lens. And a couple blog notes. my authentic Austin uniform = shorts and sandals. It got cold here. Then warm. Then cold again. I shot some stuff with an XE2. On a lighter note, I had a fun time a week and a half ago shooting behind the scenes images for Zach Theatre's upcoming production, Hedwig and the Angry Inch. During that shoot I leaned heavily on the 60mm macro lens, a lens that Fuji introduced back in its first generation of X series cameras. The focusing is a bit slower (helped a lot by the continuous image stabilization setting on the XH1 body) and a bit mechanically clunky but the images I got from the lens --- even wide open --- were very, very satisfying. Sharp without being exaggeratedly sharp. And the detail nicely rendered. For me, on the APS-C sensor Fuji bodies, it's just the right focal length and also has the advantage of being relatively small and light. 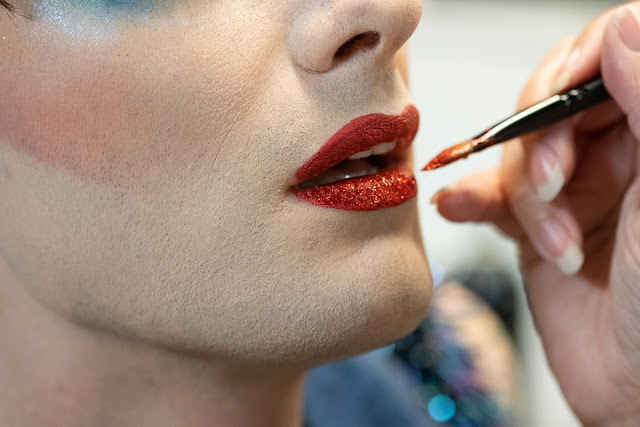 Daniel getting make-up for his role as Hedwig. I got a call from a San Antonio advertising agency today. We started talking about a multi-day project for a services client in the south Texas regions nearly eight months ago. The project stopped and started several times last year but it looks like it's finally got legs. I'll be in San Antonio scouting on the 28th of this month. The assignment requires me and my (occasional) video partner to shoot in a number of locations with talents at each location. 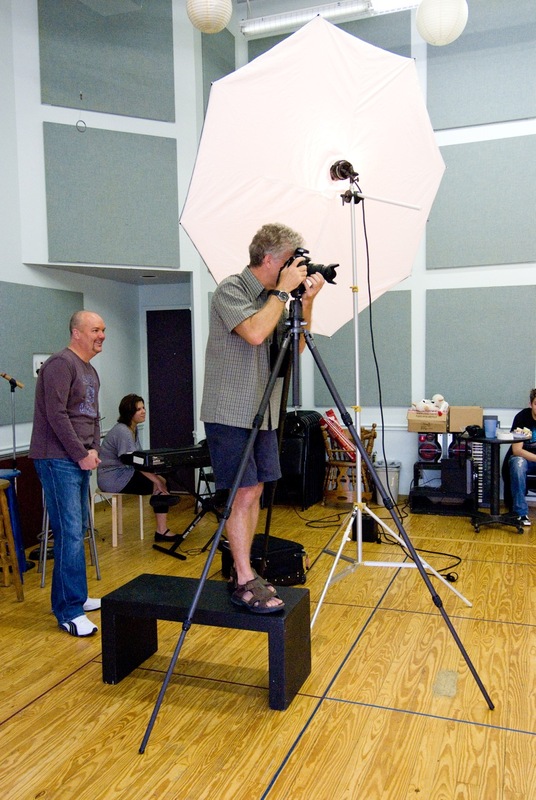 We'll set up people shots with employees and customers engaged in various tasks and processes and get both still photographs and B-roll video in each set up. I'm bringing in a videographer because the pace of the job mitigates against doing the one man band routine. Besides, James is fun to hang out with and a much better video shooter than yours truly. I'll shoot the stills with the Fuji cameras; probably just the two XH1's, and James will handle the video with an assortment of Panasonic GH5's, exciting new gimbals and our generous bag full of Panasonic and Olympus lenses. I'll bring a bag of flashes and also an assortment of LED panels. We're traveling only by car so we can bring as much photo gear and lighting stuff as we want!!!! Knowing that the client will also want wide shots of the facility interiors I decided to add a wide angle lens to the Fuji inventory (we already have the spectacular Panasonic/Leica 8-18mm for the video cameras) so I can get stuff at wider angles of view than those provided by my current widest angle lens, the 18-55mm. After a lot of research, and some discussions with smart people here, I opted for the Fuji 14mm f2.8. I know that it vignettes more than some reviewers might like but I also know that it's extremely sharp (especially in the center region) and has very low actual distortion. I'm sure the cameras will take care of most of the vignetting. 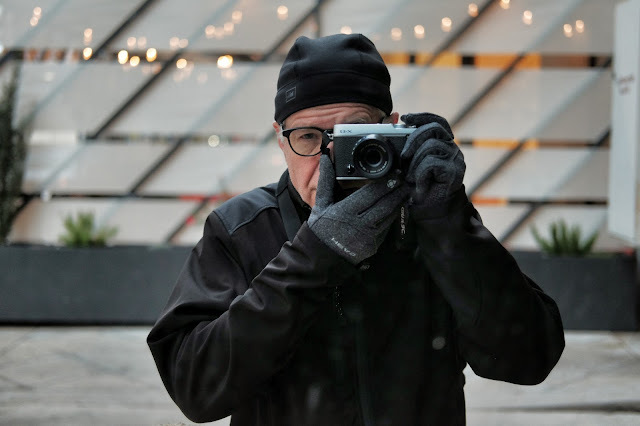 I agonized a lot about the various choices but my friend, Paul, the architectural photographer and friend of many years, convinced me that I'll never be comfortable with a wider angle of view and the I'll probably mostly be using the lens at f5.6 or f8.0. The 14mm lens should be here this week and then I think I'll take a break from buying more photo stuff for a while. I'm trying to save up to buy another car. I want to keep up with Belinda! I have my mind just about made up to buy a 2019 Suburu Forester with all the fancy accident avoidance features. Maybe even leather seats. I've appreciated using the safety stuff and the adaptive cruise control (Texas is a big state) in Belinda's Impreza. I'm also smitten with the all wheel drive. But cars are a lot more expensive than cameras or lenses, and I hate the idea of car payments, so I'm economizing wherever I can...even checking for lost change between the couch cushions. The assortment of lenses I've put together for the Fuji cameras is just about right. Down the road I may upgrade the longer zoom to the f2.8 model but I'm in no hurry. I hope you are having a Happy New Year and blazing through your memory cards making art.